Online Today is a new Big Lottery funded project led by RNIB, delivered in partnership to help people with sensory loss get online. 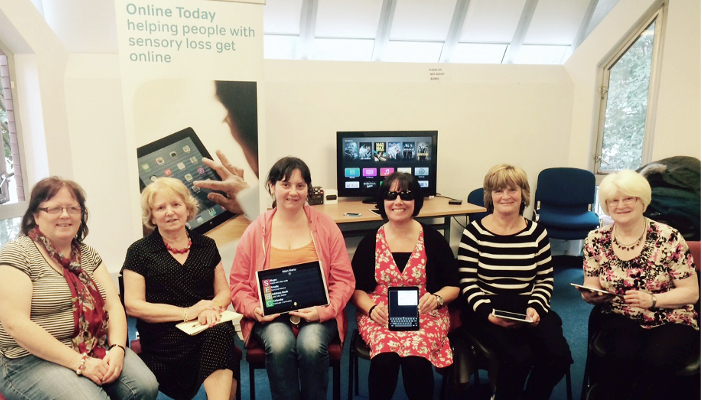 Our team is helping people realise the benefits of being online and giving advice on how to use smartphones, tablets and ereaders. Davinder Kullar, Online Today Officer, is running events and demonstrations and working with people to enable them to learn about technology. Davinder has retinitis pigmentosa (or RP) and now uses a cane and has a guide dog. Davinder explained: “I’ve changed the way I’ve done things, including which technology I use, as my vision has deteriorated. I’m the type of person who will always look for a solution. With Online Today, I will take time to understand what someone wants to achieve and explore ways of doing that. We make it really simple – we don’t use lots of technical, jargonistic language – we just focus on what you actually want to do and find ways to help you do that. "We can help and guide you, even if you’re feeling anxious about technology and getting started." At the session, we will give you the information and knowledge to realise the benefits of being online and understand how it can assist you in your everyday life. Working with you, we will tell you how to use and make the most of products, such as iPads, tablets, smartphones and ereaders, including features such as apps. There will be opportunities to have a practical hands-on experience, so you try out the products yourself, as well as watch demonstrations. "I have always used an iPad, but did not know about some of the programs that would make it more accessible for people with sight loss, such as the voiceover and magnification functions. It was a really useful day overall, and I really enjoyed meeting the other people who also attended the course." "The session I attended in Liverpool was a great help in learning how to use mobile phones and tablets. Technology has become far more accessible in recent years, but it’s not always easy to know how to use these accessible formats. The staff on the day were invaluable with their help and advice." Several sessions a month will be taking place at RNIB’s headquarters in Judd Street, London, from January to April 2016. Many more sessions for 2016 will be announced in the New Year. The Online Today events will be the perfect opportunity to learn about any new gadgets given as gifts over the festive period, with expert advisers on hand to help you get the most from products. If you already have your own device, then bring it along to learn more about how to use it. You can also learn more about Online Today and see a full list of the Judd Street events, as well as the full list of sessions taking place across the UK, by visiting our Online Today page or calling our Helpline on 0303 123 9999. We have lots of events taking place throughout the year across the UK. Use our event search to find an event near you.